Congratulations to Hubert Meier, who gave his first speech (The Ice Breaker) at the club on Monday, 23 May 2016. As part of the speech, he introduced himself and told us how he came to be in his current role at Datev, here in Nuremberg. It was wonderful to hear his story, and to get to know more about him. Well done Hubert! 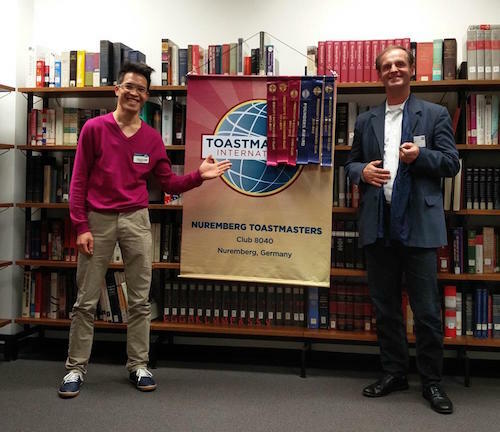 Pictured Below (l-r) Club President Phuc-An Tran (CC, CL), and Hubert Meier who was awarded his Toastmaster badge.